This was the product I most looked forward to, even before leaving Bali. I just love it. The last thing I want to eat before I die, the thing I tell everyone they must have when visiting British Columbia, the reason to even considering travelling to Canada in the first place and a damn good motivation to be alive is Dungeness Crab. Filling the bottom of a big pot with medium sized river stones practically covered with pure salty ocean water, the crabs are cleaned, lovingly placed inside and covered with a lid. The fire is cranked up and just when the lid begins to dance with the pressure of steam, you count 6 minutes, turn off the heat and slightly pull back the lid to slowly release the steam. 10 minutes later you are welcomed to heaven by Mr. and Mrs. Dungeness. Just a big container for shells as table setting and the fingers-only eating begins… Sections of leg and body are precisely pulled apart and recklessly cracked with molars. Full flavored, nutty, delicate morsels of meat are quickly dipped in melted butter before being devoured for a much needed but unnecessary confirmation. Yup, it’s still the best. A close second to this baby? Soft Shell crab. 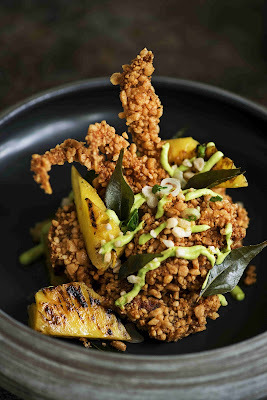 If you unfortunately are too far from Canada to eat Dungeness, hopefully you are close enough to Cuca to try our Rice Crusted Soft Shell Crab. Driving by a small farm the sign in front read “LAMB”. Treating it like a stop sign we braked and hooked a left ending up awkwardly parked in the front yard of a stranger’s house. In the background you could hear the “Baaaa Baaa” of these beautiful locally raised animals walking around the property. Knocking on the door my greeting was a simple “Hello, I like lamb.”They invited us in and we made the deal: leg of lamb and the additional bonus of a few apples from the tree where we parked. Dinner was in motion. Rubbing down the lamb with garlic, parsley, lemon zest, olive oil, black pepper and love and turning on the BBQ, the lamb was given a slow gentle browning over soft blue flames. From there transferred to a pot, lid on and cooked slowly for about 5 hours. Finally the meat was removed to cool, the juice put aside and the apples roasted. Dinner was served. I like lamb and strangers a lot.